It's a bird, it's a plane, it's... le musée de l'air! This past weekend Gregorio had some friends from Paris visiting him: the sister of a woman he had gone to elementary school with, the sister's husband, and the husband's parents. 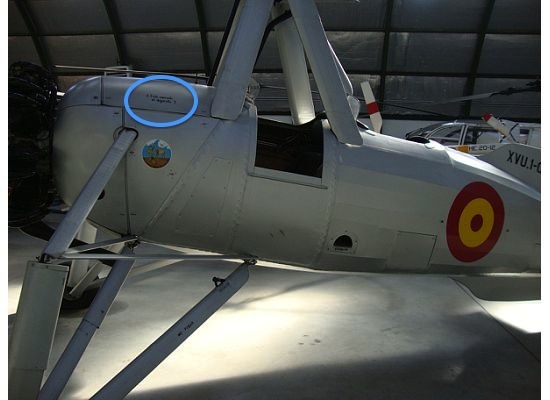 Since this was the perfect opportunity to immerse myself in some French, I was up bright and early to go to Madrid's Museo del Aire (Museum of the Spanish Airforce) with Gregorio and the two French men on Saturday. The wives went shopping in Getafe. So of course, the museum was part outdoors, part "indoors" in cold warehouse/sheds where the doors were for whatever reason kept open all day. Here's a bird's eye view of the museum, where you can see both the aircrafts that were outside, and the giant un-insulated sheds. Gregorio and his friends were all very into this type of thing. They would point and discuss the inner workings of whatever craft or specimen was in front of them. Spaniards love to use their hands when they talk, and he actually got told firmly at least three times that day, "No se puede tocar!" (No touching!) by the museum workers. Reminder up-close reads: ¿Está cerrado el depósito? Can you tell how cold I am? When our museum visit ended, we went back to their hotel to meet up with the wives. We went out for tapas and drinks until about 6pm, and later met up at 9.30 for a dinner of tapas and raciones at Rincón de Jaén. I learned that his childhood friend's sister has a Spanish mother, a Portuguese father, and grew up and lives in Paris; so she speaks Spanish, Portuguese, French, English, Italian, and some Polish. Wow.